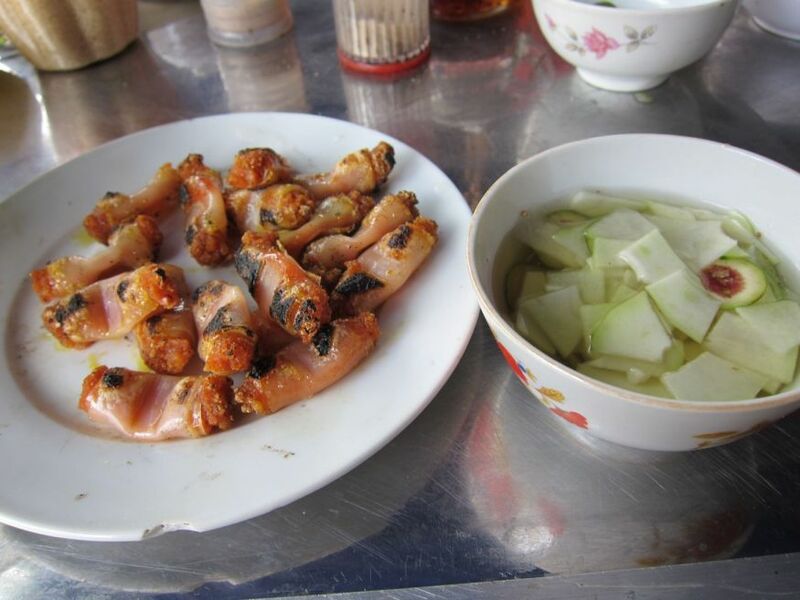 As someone who loves to eat, you have no idea how happy I was when I found out I was placed in Hanoi for my Kiva Fellowship. 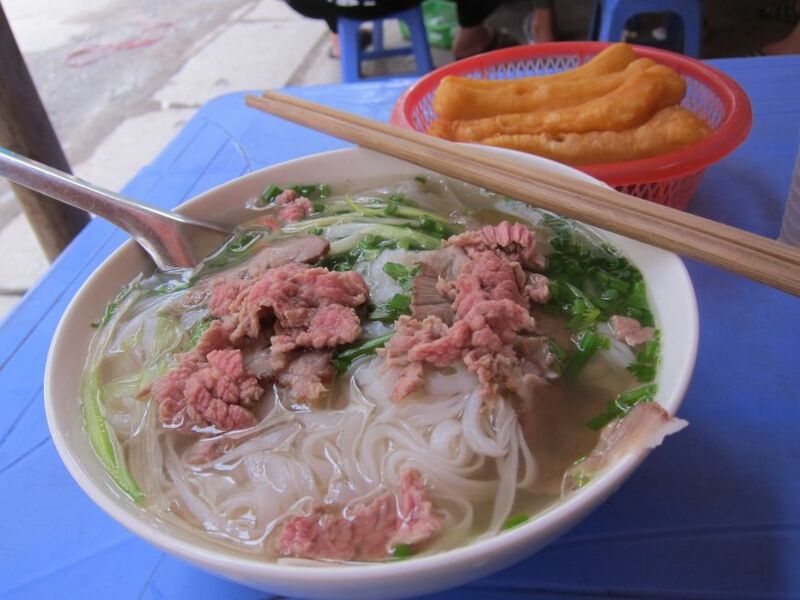 Vietnam has some of the absolute best food in the world. Vietnamese dishes commonly use lemongrass, fish sauce, ginger, mint, basil, bird's eye chili, and lime in all sorts of delicious combinations. 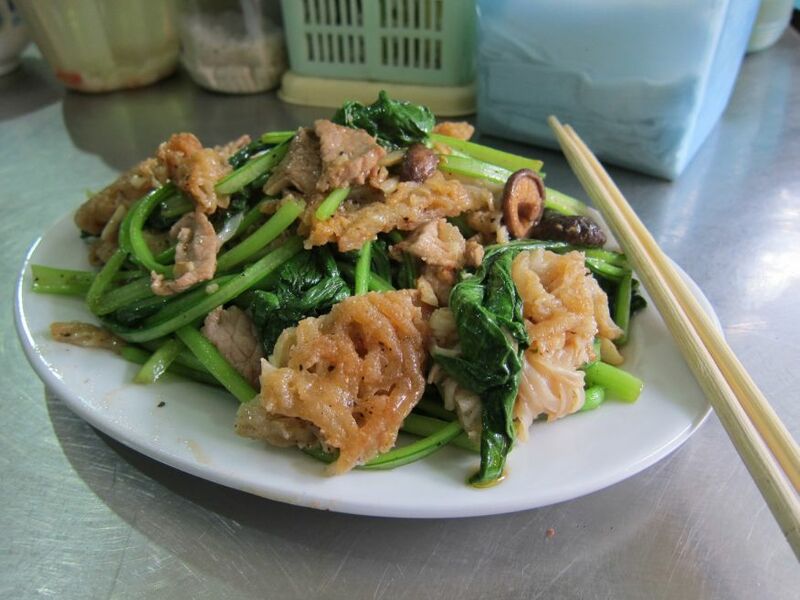 These distinct flavors combined with French influences come together to create dishes so rich and varied in flavor that my stomach actually grumbled when I read the Kiva email saying that I would be spending the next few months in Hanoi. This may have been a mere coincidence, but I prefer to think that the human body just knows what's good for it and what will make it happy. XOI: sticky rice dish with barbecued pork, pickled cucumbers, a hard boiled egg, dried shallots, and drizzled with au jus. Love this for breakfast. 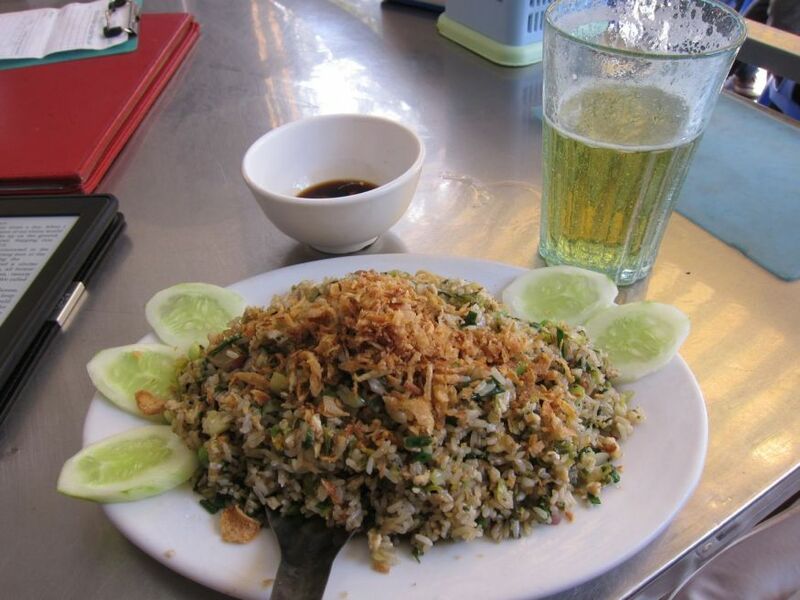 COM RANG: fried rice, served here with beef, dried shallots, and cucumbers. 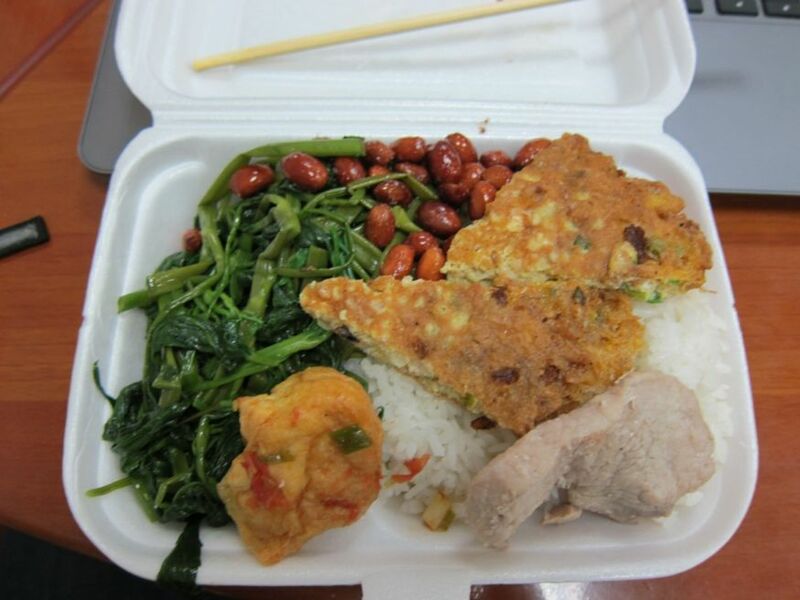 And of course, this meal isn't complete without bia hoi. 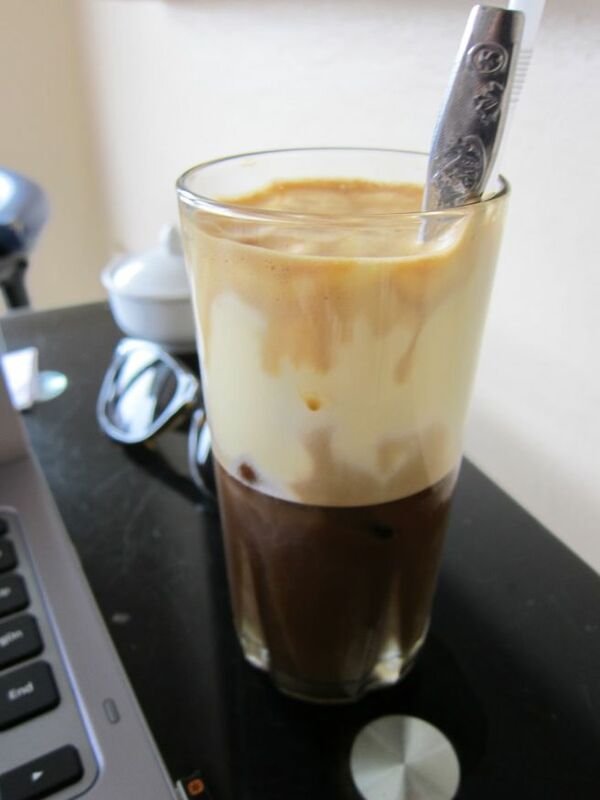 CA PHE TRUNG DA: iced Vietnamese coffee with a beaten egg white. I don't drink coffee back home, but I'm addicted to it here. 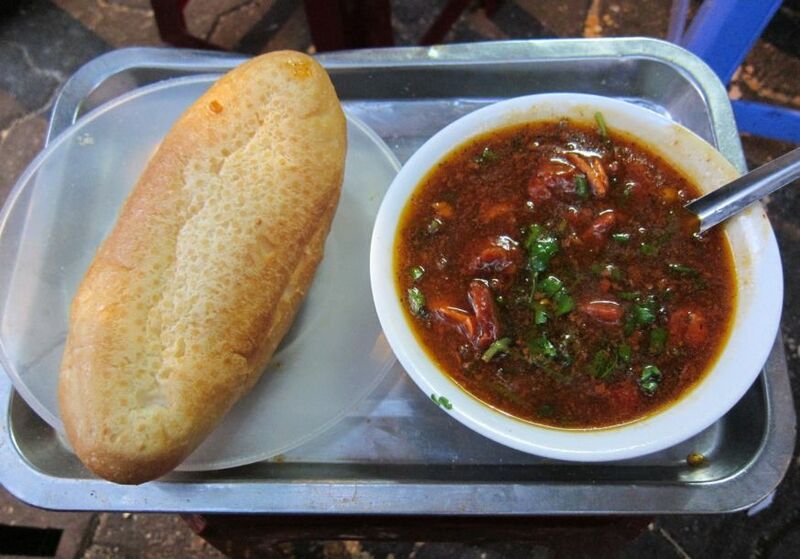 BANH MY SOT VANG: fatty beef stewed in a red wine sauce and served with bread for dipping. 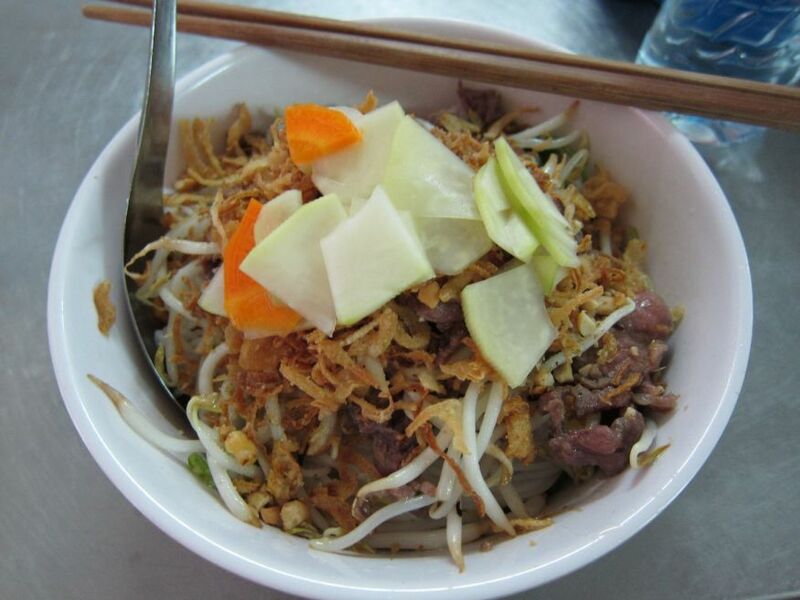 BUN BO NAM BO: thin rice noodles with stir fried beef, bean sprouts, cucumbers, lettuce, dried shallots, and peanuts. 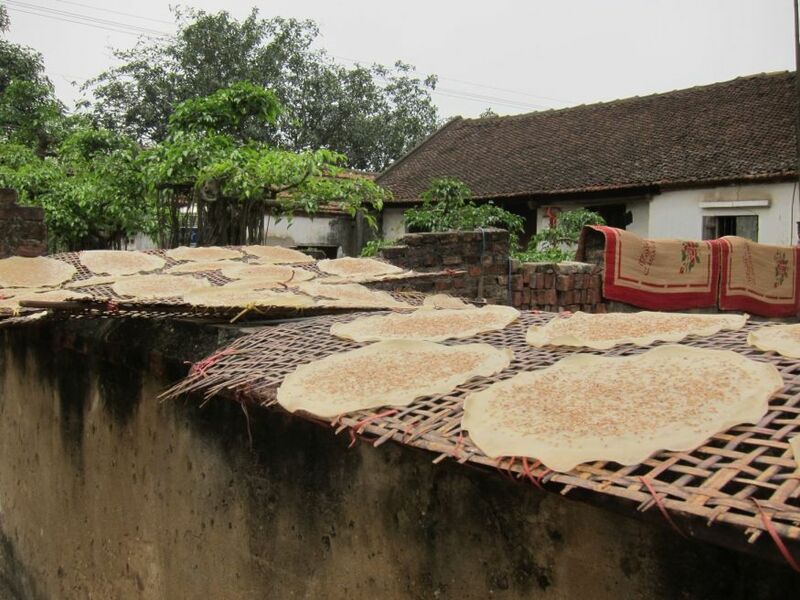 BANH DA: sesame rice crackers, a traditional Vietnamese snack. These are fresh and drying in the sun. When cooked they turn into a thick, crunchy cracker. 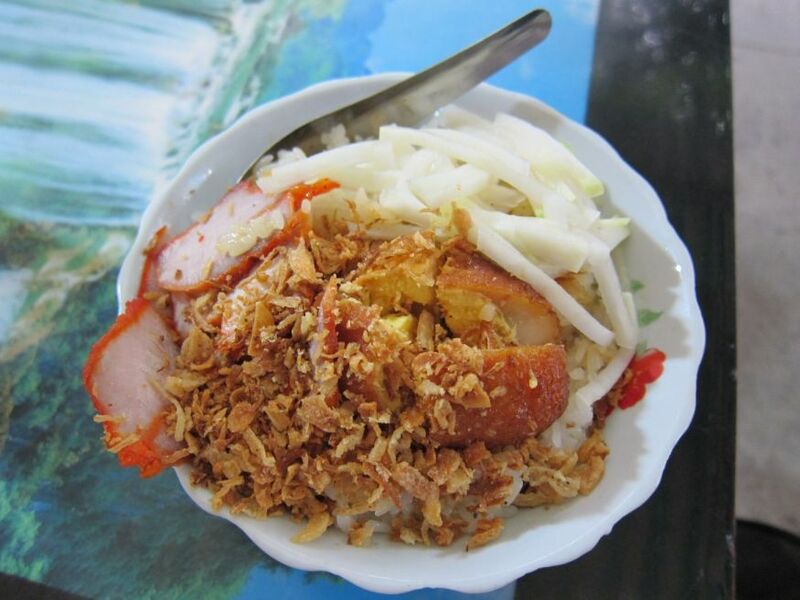 COM BUI: morning glory, fried tofu, egg, pork, salted peanuts, and rice. One of my go-to lunches. 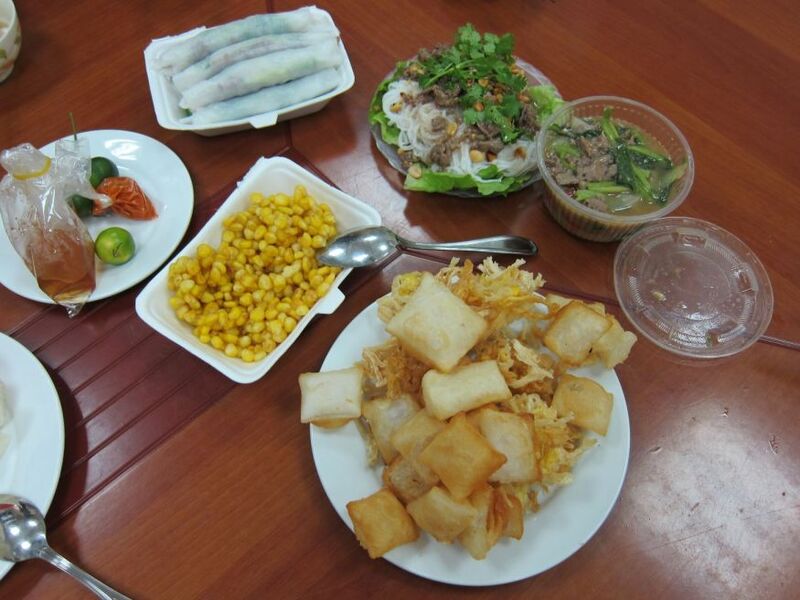 PHO CUON: rice noodles prepared a few different ways: rolled, fried, boiled. Served with fried corn. CHA TOM: grilled rolls filled with shrimp paste served with a sweetened fish sauce. 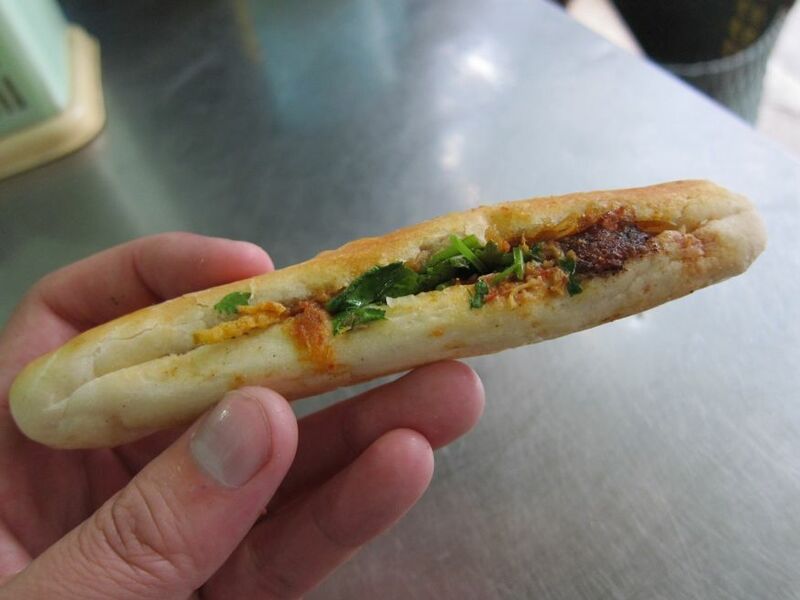 BANH MY: literally translating to "bread", banh my sandwiches can vary greatly depending on how the vendor prefers to prepare them. This one, for example, is more of a bite size snack than the larger ones made with baguettes that I'm accustomed to. What is this, banh my for ants? It still tasted good. PHO: 'nuff said. Those things in the background are Chinese donuts, which are fried and salted. Really great with soups. PHO XAO: pho noodles that are stir fried for a crunchy texture. A typical street market in Hanoi. 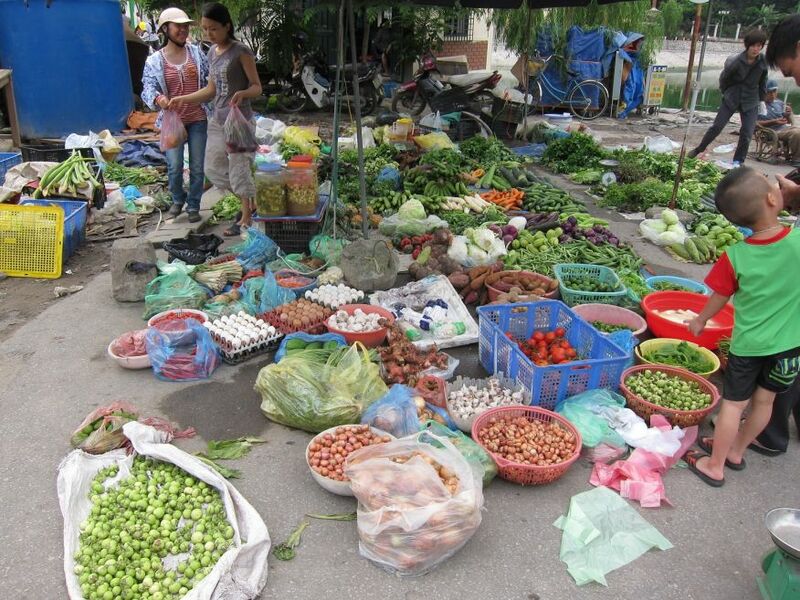 Markets like these are where all of the ingredients used to make the above dishes come from. 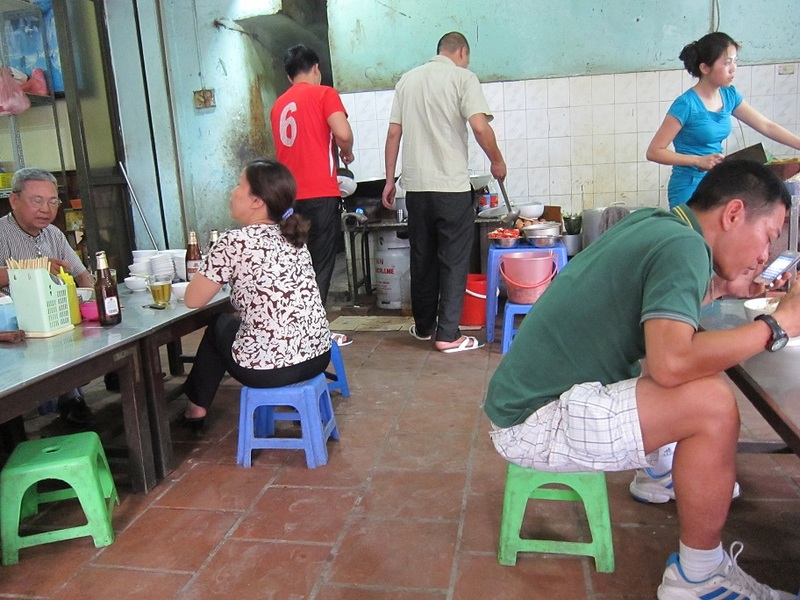 And finally, I'll leave you with a photo of the quintessential dining experience in Hanoi...fully grown adults sitting on little plastic stools that appear to be made for toddlers. It took a full month before I could comfortably sit on one for longer than 30 minutes, but now I wouldn't have it any other way. For reference, the guy in the green shirt is about 5'7". I am 6'0". My neck hurts. Honorable Mentions: It feels wrong to not include bun cha and cha ca, but I was too busy feasting to take pictures. No regrets! Jon is a member of the 20th Kiva Fellows class and is based in Hanoi, Vietnam. He is working with the Kiva field partner SEDA, which aims to alleviate poverty by offering financial services to underserved, rural populations around Hanoi. 70% of SEDA's total loans are made to low-income families, and 97% of its clients are women. Join the Fans of SEDA and Binh Minh lending team and make a loan to SEDA's borrowers today!